SOAPware DocumentationSOAPware FAQ'sFAQ's SMARTextQ: How can I change the wording and appearance of SMARText in my documentation? Q: How can I change the wording and appearance of SMARText in my documentation? A: The appearance, or text , of a SMARText Item, can be changed. For example, the "Chief Complaint" SMARText item can be changed to display "Reason for Visit" or "Patient complains of." 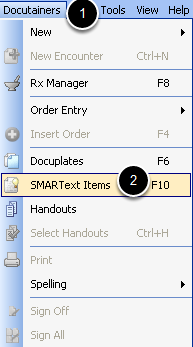 Click on SMARText Items or press F10 on the keyboard. Type the shortcut code or keyword of the SMARText item to be edited into the Find box. Click on the Find button. Click to highlight the item to be edited. Click on the Edit button. In the Display Header box (not the blue text in the large text box for it will change automatically) change the text to appear as desired. Click Save. When the shortcut code is inserted into the Subjective field, and the spacebar is pressed, the SMARText item reads "Reason for Visit" rather that "CHIEF COMPLAINT (S)." Previous Lesson: Q: How do I add a comment or free text to a structured item? Next Lesson: Q: How do I update SMARText items?